We spend a good amount of space writing about bad news. Whether it’s smoking bans and tobacco taxes or cigar companies suing each other instead of focusing on making cigars, there is a lot of news about cigars that’s downright frustrating. 5) Fighting for Cigar Rights: It may have taken awhile, but the cigar industry is finally realizing that sitting on the sidelines while anti-tobacco activists tax and regulate cigars away just isn’t an option. Through the IPCPR, CAA, and the CRA, which seeks to energize cigar smokers in the fight against anti-cigar legislation, we’re seeing renewed vigor in the vital cause that is defending our hobby. That’s important and it’s something to be thankful for. 4) Next Generation Cigar Makers: Now is a great time to be a cigar smoker, and no small reason for that is a younger generation of cigar makers that are hitting their prime. Pete Johnson of Tatuaje, Dion Giolito of Illusione, Jonathan Drew of Drew Estate, Christian Eiroa of Camacho, Erik Espinoza and Eddie Ortega of EO Cigars, and others are part of a new generation of cigar makers. They are dispensing with some of the stuffy formalities while they focus on making great, interesting, innovative cigars. 3) Helpful Cigar Shop Keepers: Some of the most generous and knowledgeable people around are cigar shop owners and employees. They are passionate about their business in a way that you’ll never find in a shoe store or convenience shop. I’ve had store owners spend hours talking with me about cigars, knowing that at the end of the day I’m not likely to buy more than a few sticks. It’s one of the reasons that so many people aren’t simply cigar smokers, but cigar enthusiasts. 2) Experienced Cigar Veterans: Sure, the new guys are getting tons of press these days, but it’s the older generation that makes it possible. Today there are so many living legends still making cigars: Henke Kelner of Davidoff, Avo Uvezian, José Seijas and Frank Llaneza at Altadis, Benji Menendez of General Cigar, Ernesto Perez Carillo, Guirellmo León of La Aurora, Don Pepin Garcia, the Fuentes, the Padróns, and so many others. 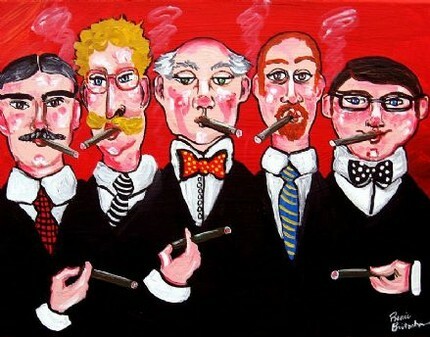 We are lucky to be cigar smokers at a time when so many masters are still going strong. 1) Fellow Cigar Smokers: There may be many living legends making the cigars we smoke, but we don’t spend a lot of time smoking with the Carlos Fuente’s of the world. More often we’re lighting up a cigar with our fellow brothers (and sisters) of the leaf. Fortunately, they’re a friendly and generous bunch of people. As cigar smokers, we instantly share a bond, and we’re eager to share our tobacco treats. That’s why the camaraderie we share with fellow cigar enthusiasts is still the aspect of smoking that I am most thankful for. Great post! Cigar enthusiasts definitely do have much to be thankful for. Have a great thanksgiving!